Surround yourself with charm at Fairway Cottage. Nestled amongst alpine splendour, this quaint chalet promises the perfect mountain getaway for your upcoming ski vacation to Kamloops, British Columbia. 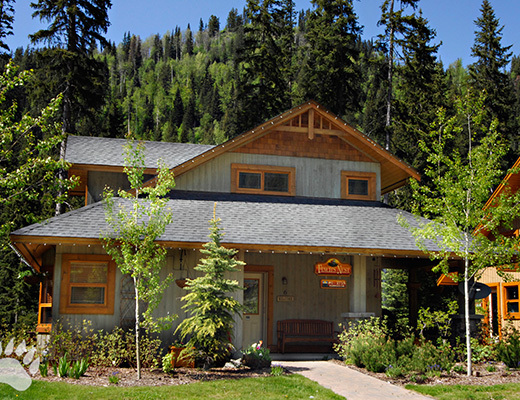 Situated on the third hole of the Sun Peaks golf course and within a two minute drive to the lifts, this rustic-inspired three bedroom rental property, boasting vaulted ceilings and a lovely stone fireplace, offers cozy accommodations for as many as nine guests to enjoy. After a long day, settle in to the warm atmosphere of the relaxed living room with its comfortable furnishings and neutral color palette. The kitchen is a gourmet delight with such offerings as modern appliances, contemporary light fixtures and shaker-style cabinetry. Each bedroom is host to attractive appointments and soft linens, ensuring a peaceful slumber, while the private hot tub provides the means for soothing tired muscles.